Aloha from Hawaii! It has been a while. While the Democrats continue to look for ways to use immigration reform as a way to win more House seats next year, immigration court backlogs have climbed to 344,230, an 85 percent rise in the past five years. More data from TRAC this month reveals that less than 1 in 9 persons targeted by ICE detainers have criminal records, and over 62 percent of persons in detention have no criminal records, even though the Obama Administration says it is focusing on only deporting so-called criminals. 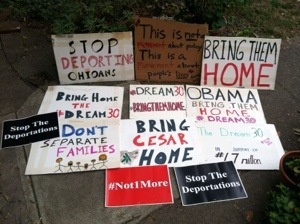 Local and state organizing efforts have continued to end Obama’s record-breaking deportations and challenge the growing archipelago of detention policies. In Arizona, protestors chained themselves to three buses in order to stop Operation Streamline, a program that deports every undocumented immigrant caught at the border. Later, 250 protestors marched to the local ICE office while six protestors blocked the entrance to Eloy Detention Center, demanding an end to deportations. In San Francisco, undocumented immigrant activists came together to stop a deportation bus and demand an end to deportations. Advocates from the National Immigrant Youth Alliance, continued to work with families to bring home loved ones who had been previously deported, winning parole for 10 out of 34 persons. The mainstream media called it a protest for immigration reform, but even the legal observers at the action complained directly to me that the arrests and charges were pre-planned and pre-negotiated with the Capitol police. The political theater also angered various community members. If his legal authority is not in question, then it’s only a matter of political will. In determining his way forward, the president must decide what side of history he wishes to be on: with the reformers or with the obstructionists. That’s why seven undocumented people handcuffed themselves to the White House fence calling on him to act and hundreds more shut down immigration and customs enforcement operations in Arizona earlier this month in hopes of spurring the president to follow suit. Obama should also consider who’s on the other side of this debate: fringe lawmakers who have vowed to oppose him no matter what. The lesson from last week’s budget showdown is clear: The president must no longer capitulate to a vocal, irrational minority in Congress. With the stroke of a pen, he has the power to advance the immigration debate and do right by thousands of families who just want a chance at a better life. What is he waiting for? In the end, Congress must take action for a permanent solution. No one disputes that. But we must live with the realities of deportation records being broken every year. The Obama administration has accumulated this legacy as a concession to the least reasonable members of government who are controlled by their primary voters. If President Obama were to halt deportations, it could serve as a model for Congress, and would put pressure on Congress to create a solution that would then displace the President’s discretion. As President Obama made another speech for immigration reform, Senator Bob Menendez (D-NJ) had the undocumented mothers of the DREAM 30 — who are currently detained in Texas after trying to come back to the U.S. — arrested after a sit-in in his D.C. office. The undocumented parents were trying to get the Democratic Senator from New Jersey to make a phone call and write a letter to the President requesting an exercise of discretion and parole for the detained Dreamers. Various members of Congress have already written letters in support of the Dreamers who are detained. The arrested parents could have been subjected to detention and deportation too had it not been for the Capitol’s non-ICE detainer policy. The parents of these Dreamers have sworn to be back on the Hill this coming week. In the meantime, Silky Shah, interim ED of the Detention Watch Network (DWN), put the spotlight on detention by informing us that even comprehensive immigration reform could leave thousands in detention. That’s probably an understatement given S. 744, in its current form, criminalizes entry without inspection with up to one year in prison, re-entry with up to three years, and expands avenues for targeting and incarcerating the undocumented. For example, one of the amendments to S.744 mandates that ICE receive a weekly list of persons that failed e-Verify, most likely for fresh witch-hunts against the undocumented. But it is heartening that DWN recognizes and is vocal about how comprehensive immigration reform won’t do much for detention. In the final analysis, the campaign for comprehensive immigration reform is not a movement. It is a multi-million dollar campaign, organized by some Democratic Party astroturf groups in Washington D.C. who are more concerned about their paychecks and less about immigrant lives. Anyone who says otherwise is delusional. 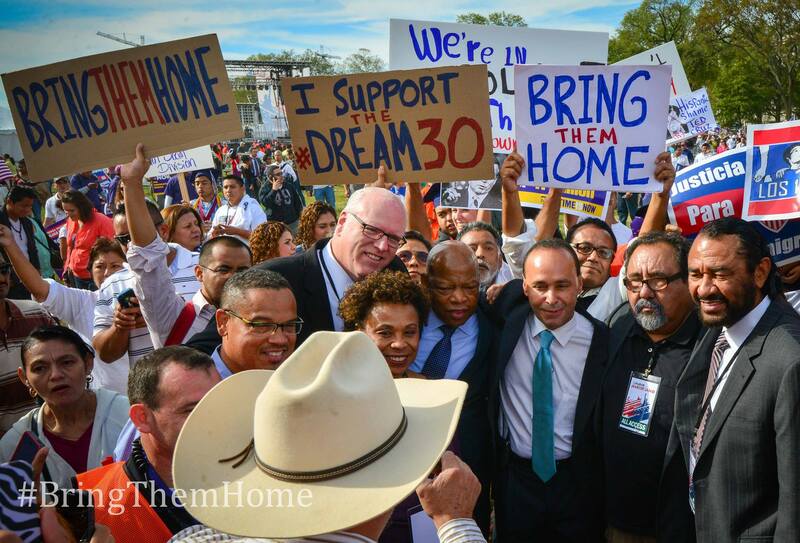 The immigrant rights movement is led by people outside the Beltway. It is led by groups such as Coalicion de Derechos Humanos, Community2Community, Puente Arizona, Families for Freedom, Familias Unidas por la Justicia, the day laborers working with NDLON, the NIYA, IYJL, NYSYLC, the IYIC and the amazing array of undocumented youth leaders working in their communities. In case anyone is wondering about my blog hiatus, I’m using this time productively to write my book. This week I’m in Hawaii, which is halfway home. I’m inching closer and closer to ending my fourteen year imprisonment and exile. More updates soon!